Monday afternoon, about a dozen of us arrived at about 12:00 and stayed for a few hours. I decided to try the fish and chips which were very good. Georges - Bell End Bitter 4.10 Bespoke house beer. Mid-afternoon on a Friday and Old Leigh is packed. Every table taken here, inside and outside. Swarming with children. Mersea Island - Oyster 5.00 A particularly good, smooth, black Stout. Early afternoon. The bar was full of people eating fish and chips, so I sat out in the breezy garden with a view of the estuary. Mighty Oak - Old Man & The Sea 4.10 An oily, black Stout. Not too many people about on a January afternoon so we sat in comfort and enjoyed what we could see of the views on a cloudy and overcast day. 12:00 First stop on a tour round the LTS railway network. Four others in. The barmaid had worked at the Rochford beer festival on Tuesday. Bit of a busman's holiday. Georges - Cockleboats Best Bitter 4.00 Very flavoursome. More a red ale than a best bitter. I resist the fish & chips here (my custom goes to the excellent take-away part of Simply Seafood at the other end of the street) and sit in the relatively secluded back garden. Georges - Cockleboats Best Bitter 4.00 A dark coppery sort of colour. Malty and fruity. Evening meet up with Friday Evening Group who had been in situ for hours. I can imagine this venue being good on a wet and windy and cold winter's evening but tonight was draughty (nay windy) inside with overpowering vinegar fumes from fish and chips on every second table. I sneaked a quick pint in the suntrap garden here in a break from the Crooked Billet. Georges - Wallasea Wench 3.60 Pale copper colour. A nicely-balanced, quaffable pint with a fairly low hop rate. 2110 hours through the door. Main reason for visit to Leigh was to see this pub but told "We're closed". Upon enquiry it seems they close at 2100(ish) in Winter. Pity as, from experiences in other High Street pubs later, there was a lot of business about. A rather wet and miserable summer afternoon, we went for a stroll along the sea front and found this fish and chip shop/ice cream parlour/pub, we decided to investigate, and were delighted to find four real ales on hand pump. Georges - Dragon's Gold 3.90 What a surprise, beer from a new micro-brewery in a bar at the back of a chip shop. Pale in colour, and a good quaffable beer. 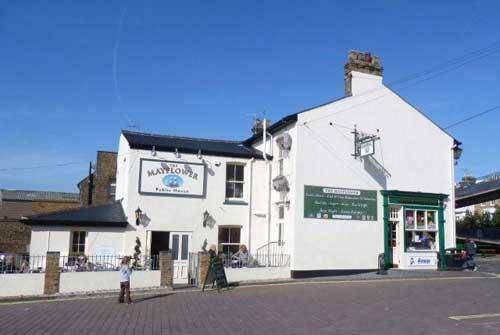 The pub is found in Leigh-on-Sea, Essex, SS9 2EN. 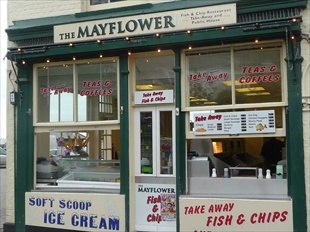 A High Street comfortable bar situated at the rear of the Mayflower Fish & Chips and soft scoop ice cream parlour. South East Essex CAMRA Branch 2014, 2015 & 2016 Pub of the Year. 5 handpumps. Outside riverside seating. The passenger manifest of the Mayflower written on the wall above the rear windows is noteworthy. We have visited this pub 10 times, seen 25 different beers and tried 10 of them.